The DFM hosted the first Basic Life Support in Obstetrics course for SMPH students in February. 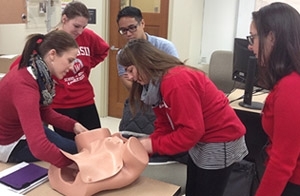 On February 14, 2015, the Department of Family Medicine (DFM) hosted the first Basic Life Support in Obstetrics (BLSO®) course for students at the UW School of Medicine and Public Health (SMPH). In the day-long course, 14 DFM faculty and resident instructors taught 48 medical students and four physician assistant students techniques for attending a normal delivery—and how to recognize and manage obstetrical emergencies. The course was a joint effort by the DFM’s Office of Medical Student Education (Joyce Jeardeau, coordinator) and the SMPH’s Family Medicine Interest Group (FMIG). Jacqueline Gerhart, MD, who leads the FMIG and served as course director, said the BLSO course can help students prepare for their third- and fourth-year family medicine, OB, and pediatrics rotations. Maternal resuscitation and postpartum hemorrhage, neonatal resuscitation, and shoulder dystocia management were among the clinical skills taught in the course. Students who have a special interest in maternity care can also go on to take the Advanced Life Support in Obstetrics (ALSO®) course upon which the BLSO course is based. Participants said they appreciated the course’s low student-instructor ratio, the opportunities for hands-on learning, and the open and positive attitudes of the instructors. “It’s great to know how much family medicine can do in obstetrics,” said one student. The course, like the ALSO course, has roots in the DFM. Lee Dresang, MD, co-developed the BLSO course in 2012. He, along with DFM faculty, residents and colleagues, taught it in Madison for the first time—to paramedics at Ryan Brothers Ambulance Service—in January 2014. John Beasley, MD, and James Damos, MD, developed the original ALSO course in 1991; it has since been taken by over 160,000 maternity care providers in over 60 countries. Both courses are now owned and run by the American Academy of Family Physicians (AAFP).